Lionel Atwill ... James Mortimer M.D. Barryman: Hello, there! Hello, there! Is something wrong! Q: Denis Conan Doyle---Did Rathbone & Bruce Meet Him? Q: William Shakespeare---Did Rathbone & Bruce Meet Him? 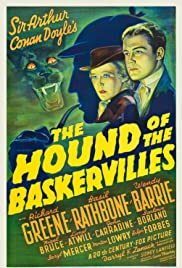 "The Hound of the Baskervilles" was the first movie that paired the great actor Basil Rathbone as Sherlock Holmes and Nigel Bruce as his bumbling yet lovable assistant, Dr. Watson. The two actors embody the characters of Holmes and Watson, and it's a delight to see the interaction between the two. This movie is great on all levels, from the creepy atmosphere of the moors where the "hound from hell" roams, to the performances of all the actors involved. Richard Greene, who plays Sir Henry Baskerville, and John Carradine also give solid performances. I remember watching this movie on late night TV with my sister when I was a kid and being genuinely frightened by the scenes on the moor when Richard Greene is being chased by the hound. For me this is the best of the Sherlock Holmes series of movies that was made in the late 1930's and 1940's. A must see!